Last month I sat the VCP7-CMA exam (or 2V0-731 as it is affectionately known). The exam is new but I wanted to give it a shot while a had the chance and before other things consumed the diary. I got a 335 score, it was close but I managed to pass. For me it was way tougher than VCP6-NV. 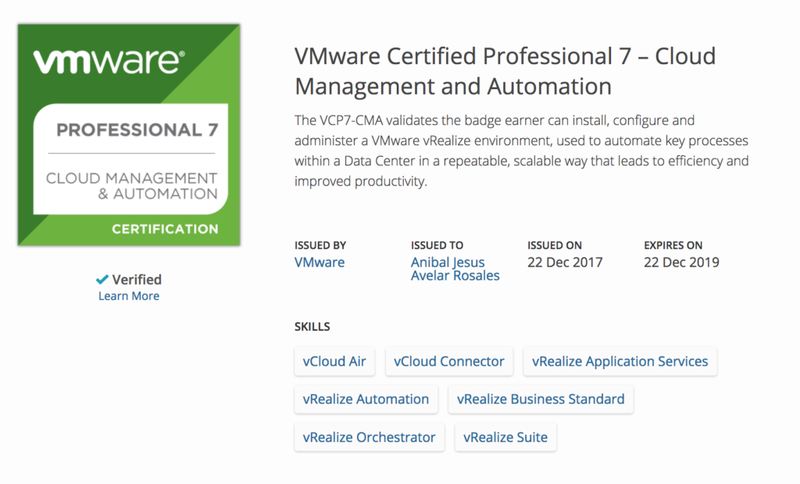 I already had taken last year VCP6-CMA (2016), but saw that the VCP7-CMA was created, then I decided to do. After two postpone times I could take it. It was a challenge because I confess, I almost didn't study, even one day before, I tried to postpone one more time, but I couldn't. I studied reading some pdfs in the documentation (reference architecture, foundations, installing, configuring, managing) but I still got caught off guard with stuff like business management and composite blueprints. You should pay special attention to XaaS and vRO stuff. I recommend this guide. The exam is 85 questions in 120 minutes (for not native english speakers). I used only 80 minutes. The questions I didn't know or I had doubt, I didn't stop so much. Be careful, because the exam is based on vRA 7.2 rather than the latest 7.3. Then some little things are different. Last recommendation, if you want to use some dump exam, be careful, all are wrong, they have many answers wrong and are different among them. I preferred to study instead. Now, I go for VCAP7-CMA (3V0-732).